The thrilling Deontay Wilder vs. Tyson Fury heavyweight blockbuster, a sure-fire Fight of the Year candidate, will air on SHOWTIME this Saturday, December 8 at 9 p.m. ET/PT. 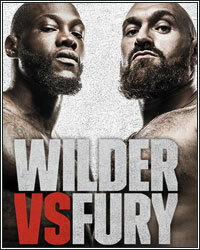 The WBC Heavyweight World Championship bout between the 6-foot-7 unbeaten American champion Wilder and 6-foot-9 challenger Fury originally aired live on SHOWTIME PPV® on Saturday, December 1 from STAPLES Center in Los Angeles. On Saturday, both Wilder and Fury made strong cases for 2018 Fighter of the Year honors. Wilder faced the two toughest opponents of his career this year including a spectacular knockout win over Cuban slugger Luis Ortiz in a Fight of the Year candidate in March. Fury, the lineal heavyweight champion, returned from a two-and-a-half-year layoff to score two wins in a span of 10 weeks before facing Wilder. On Saturday, he miraculously withstood a devastating, final-round knockdown that appeared to knock him out cold. Fury rose dramatically and continued to fight until the final bell to cap an effort that will go down as one of the greatest comeback stories in all of sports.